“Brandywine has quickly become one of my favourite summits. It’s a great mix of easy hiking and more challenging boulder-hopping with some steep terrain and a bit of route-finding thrown in for good measure. And then there are the stunning views. 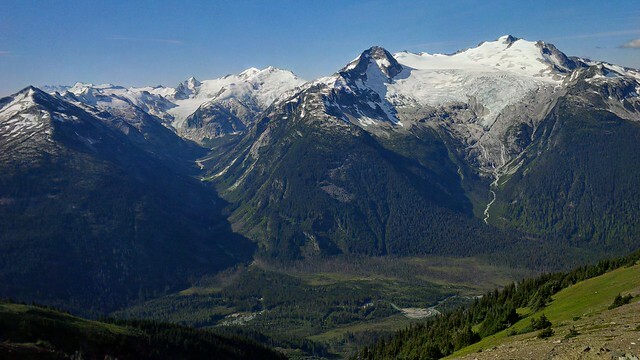 Mountains, glaciers, meadows, lakes… Definitely a hike to save for a sunny day. The new trail into the meadows still has a muddy spot or two but it’s a massive improvement on the old trail. We were in the upper meadows within an hour or so. Beyond that there is an intermittent trail and cairns for guidance up to the ridge. More cairns point the way up to the higher part of the ridge, although they run out a couple of hundred metres short of the summit, which is where the route-finding comes it as the summit can’t be seen at this point. The summit itself is a small bump on top of a bigger bump, big enough for our group to find (un)comfy rocks to sit on to enjoy lunch. The road to the upper parking lot is very rough and steep in places: our CR-V struggled in a couple of spots with a full load of 5 hikers. A vehicle with some clearance is a good idea as the bumpy road causes the vehicle to bounce quite a bit. A Subaru Outback made it up OK though. Budget about half an hour for the logging road. “Nikolay, Estafan, Kelley, Michelle, Jodi, and Jordon joined me on a hike around the new Skywalk Trail in Whistler. This trail connects a few existing trails and explores the alpine on the east side of Rainbow Mtn. There are a couple trailheads one can use including the Rainbow Lake trailhead, the end of Alpine Way and the end of Mountain View Drive. We chose the latter as there is plenty of parking right at the trailhead (if you opt for Alpine Way, you have to park on Drifter Way and walk the road to the trailhead). The route is well signed with plenty of official and unofficial notices which is helpful as there are lots of trails that branch off in various directions. We headed up the Lower 19 Mile Creek trail and then up the Screaming Cat Connector to the Flank trail. Finally up the Screaming Cat Lake trail. The junction with the start of the Skywalk North trail is unsigned but is at a clearing within a minute or 2 of the lake. A fainter trail (the one you want) heads left and around the lake. Iceberg Lake is only 100 m higher in elevation than Screaming Cat but the trail rambles up and down through alpine glades so you will feel like half of the elevation gain is in this section. You actually descend 100 m to Iceberg Lake where Skywalk North ends. Pick up the Upper 19 Mile Creek trail about 10 m north of the outlet of the lake. We elected to stick with this trail instead of branching off on the Skywalk South trail about 700 m east of Iceberg. Skywalk South climbs higher and spends more time in the alpine but the weather wasn’t providing much in the way of views. Upper 19 Mile connects with the Flank trail where one has to go east for about 50 m to find the continuation (Lower 19 Mile). There’s many mystery branches off this portion of the trail but the route we wanted was signed at all junctions. It took us about 7.5 hours with a lunch break but not much other lingering due to the cold weather. 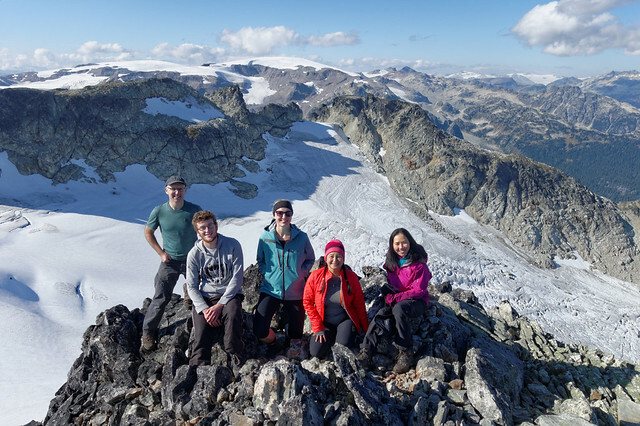 “Seven of us went to explore the new Skywalk Trail system near Whistler. We started from Mountain View Drive and proceeded at a relaxed pace along the 19 Mile Creek trail. This well-maintained trail was a joy to follow as it was well-graded and featured numerous bridges and boardwalks. We gradually ascended through a pleasant forest toward the alpine area at the eastern slopes of the Rainbow Mountain. After hiking for about 3 hours, we reached the junction with the Skywalk Trail and then continued for another kilometre along the Skywalk North trail till we finally arrived at Iceberg Lake. 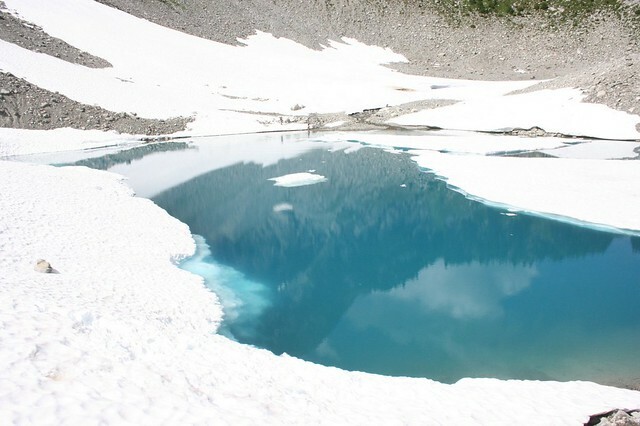 This picturesque turquoise lake is located right underneath the Rainbow Mountain glacier. As the name suggests, the lake was partially covered by floating ice. We spent the rest of the afternoon relaxing at the lake, taking pictures, and exploring the slopes to the south of the lake. Bugs were quite bad at the alpine portion of the trail. Also, some of us got stung into the legs by wasps at two separate location: near the big yellow sign about the trail crossing a bike path (about 20 min into the hike), and at another location closer to the alpine. If you take this trail this August, it’s a good idea to wear long pants. Hopefully, wasps won’t return next year, once the trail becomes more popular. “Eight of us woke up early and braved the frozen fog morning to head out to Rainbow Lake. The trailhead is found along a residential back road in Whistler just off Alta Rd, very accessible. The icy wind at the trailhead had us and our hands frozen in seconds, but we left it behind as soon as we ducked into the trees. Thanks to the full week of perfect, blue-bird days the trail was hard packed and manageable with boots or micro-spikes up until around 5.5 km, where the trail split into a fork, the left side headed to Madely and the right to Rainbow. The trail thinned out after that and the accidental post-holing increased. The meadows before the lake were stunning with hoar frost that was bigger and more dramatic than any of us had ever seen. It was also the first bit of sun that we had encountered the entire way so it felt great on our frozen faces. We had a very quick lunch on the sunny lake and had to leave the sun behind to try and make it back to the cars before dark, which we did. “An intrepid crew of five joined me in an exploratory trip up Mt Sproatt. All of them not merely undeterred by my warnings of cloudy weather, deep snow and tough trailbreaking, but full on embracing it! Knowing the challenging day ahead, we were well prepared with colourful toques, thermoses of tea, layers galore, headlamps with fresh batteries, GPS, maps, compasses, walkie talkies, avy gear and cookies. Due to the heavy snow conditions and limited daylight hours, we didn’t make the summit but we gave it a good shot and enjoyed a full day in winter paradise. Given the slow slog that is breaking trail uphill, it was about 5 hours up and less than an hour down. Colleen: Take nearly two metres of pristine fresh powdery snow. Add one snowshoer who’s determined to move through it by any means possible. Result, invention of new sport, snow swimming! Estafan: The highlight of the day was when my foot decided to go down a hole in the snow above a small creek. I thought it fell into the creek but it didn’t. I’ve got to hand it to Fred the Energizer Bunny for pulling me out of that rabbit hole with such ease! Darcy: The trees were draped in snow like a village of ghosts. It was challenging but rewarding to climb up steep slopes of snow, wading through waist deep whiteness. Stephen: The best part was listening to skiers on Whistler Blackcomb narrate their super-exciting day on the slopes over the walkie talkie. My attempt to spice things up with a turkey joke didn’t get any response though. Tough crowd. Chris: My favourite part on steep snowshoe trips is always coming down. And there were some great drop-offs on this trip to ski over. I probably broke my snowshoe foot plate on one of those descents. You can get replacement bindings at MEC but they don’t stock them – you have to order them. Hopefully, I will get my replacement in time for my holidays! I didn’t get a quote from Fred, but I know the rest of us won’t forget pushing his car halfway up a looong hill!